Youssef, originally a cardiothoracic surgeon, now hosts a popular TV show called Al-Bernameg (“The Program”) which boasts an estimated audience of over 30 million, according to CBC. An arrest warrant was issued yesterday, following complaints about his show at the beginning of the month. 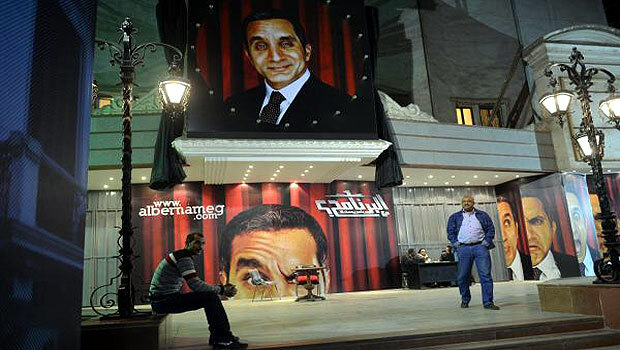 It is not the first time Youssef has received negative legal attention; the Egyptian prosecution has previously led investigations against the Youssef—the latest of which took place in January—although this is the first time the satirist has been formally named in an arrest warrant. According to local reports, Youssef voluntarily showed up at the prosecutor general’s office on Sunday, so as to avoid arrest. He was wearing an oversized version of a graduation hat modeled on one donned by the president when he was awarded an honorary degree in Pakistan earlier in March. This is the latest case to raise concerns over press freedom under the conservative Muslim Brotherhood leadership. “It is an escalation in an attempt to restrict space for critical expression,” said Heba Morayef, Egypt director at Human Rights Watch. Prominent liberal politician Mohamed ElBaradei said it was the kind actions only seen in “fascist regimes”. “It is the continuation of the failed and ugly moves to thwart the revolution,” he said.